My new Yaesu FT-857D is pretty cool, but it didn't have a "Tune" button like the old TS-440S, which would put out a CW carrier at about 10W. It was also difficult to adjust a tuner with the tiny, relatively useless LCD meter; it was hard to decide if the SWR was going down, especially with the tuning sharpness of my antenna tuner on some bands. Fortunately Yaesu made it easy to add on these functions. I've got to say this wasn't my idea. 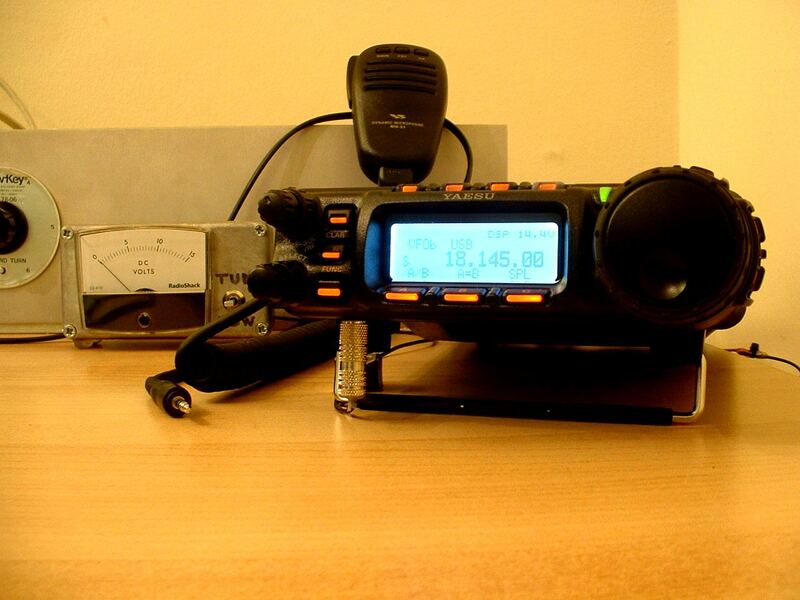 I used Emery, KC5LIO's circuit that I found on the FT-857 Yahoo group. 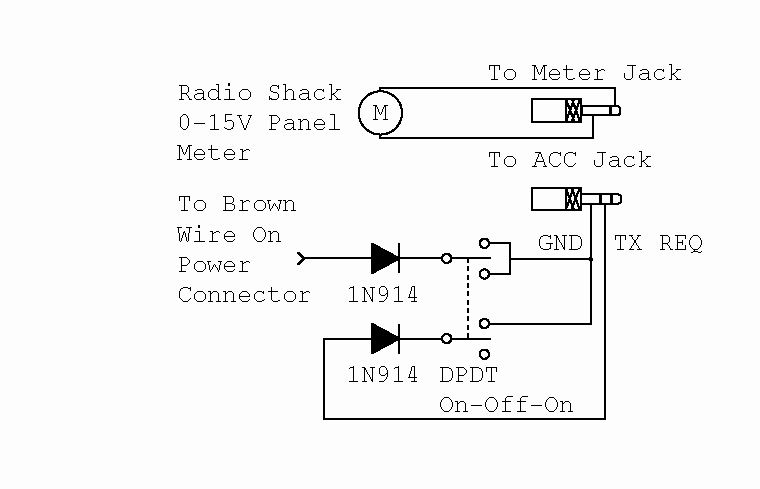 It was also there that I discovered that the Radio Shack 0-15V panel meter (#22-410) has a 0-1mA movement, which is the output of the FT-857's meter jack. Here's the new radio with the meter/tune box on the left. The circuit is dirt simple, and I had everything I needed except the meter just laying around the house. There is a brown wire on the FT-857's power connector. Grounding it sets the radio's output to 20W. The tuning is accomplished by grounding the "TX REQ" conductor, which is the ring of the ACC jack's 1/8" stereo plug. 1N914 diodes are used to keep the brown wire and TX REQ, which are at different logic levels, from affecting each other. An On-Off-On DPDT switch is used. Switch up, both Low Power and TX REQ are grounded, putting out a 20W carrier. Switch down, and you just set the radio to 20W mode. Switch in the middle, the radio is in usual full-power mode. The meter just plugs into the analog meter jack on the bottom of the front panel with a 1/8" mono plug. I housed them in the same enclosure for convenience. A closeup of the box. 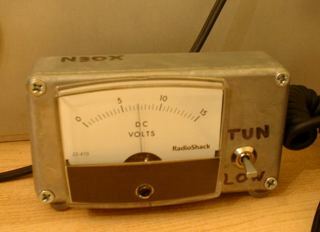 It's a simple, cheap and flexible way to get a tuner output for manual tuner adjustment. The analog meter is nice for other things too; it works as an S-meter on receive, and it's already pseudo-calibrated; that is, a 9V reading on the meter is s9, a 5V reading is s5, etc. 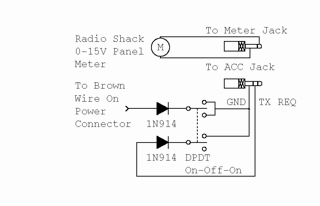 Just remember to not use the 15k resistor that comes with the Radio Shack meter.